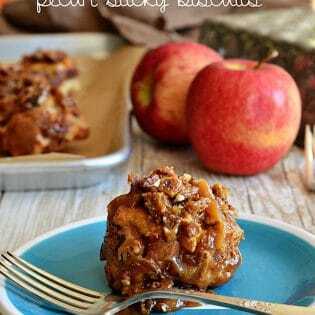 Grab your tool belt, I have a treat for you today! 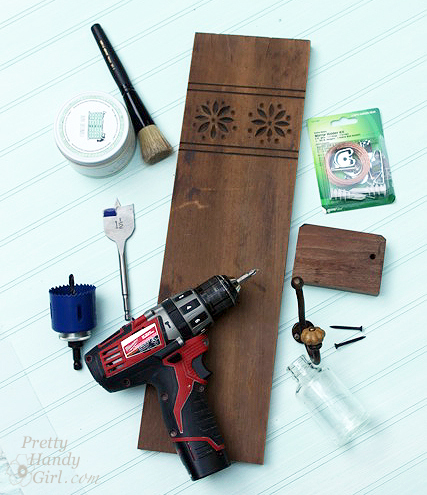 We are going to build a Reclaimed Wood Sconce and Hook with Pretty Handy Girl! Hello TidyMom readers! I want you to imagine something for a moment. There you are rushing out the door to take the dog for a walk, but you spend 10 minutes looking for the leash. Or you’re late for an appointment, but where the heck did you put your keys? Arrghhhh. Frustrating right? 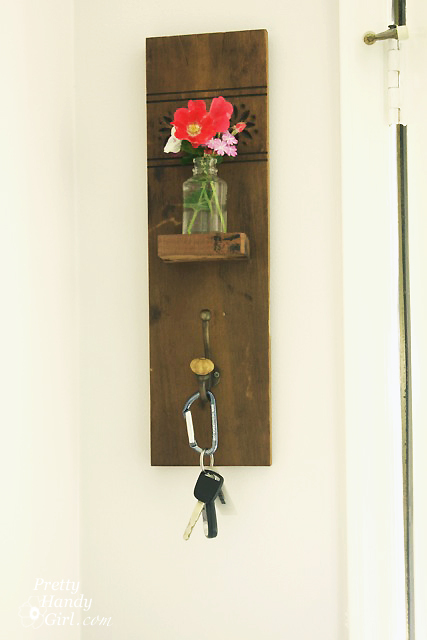 I’m here to show you how to make that super adorable vintage wall vase and hook you saw above. 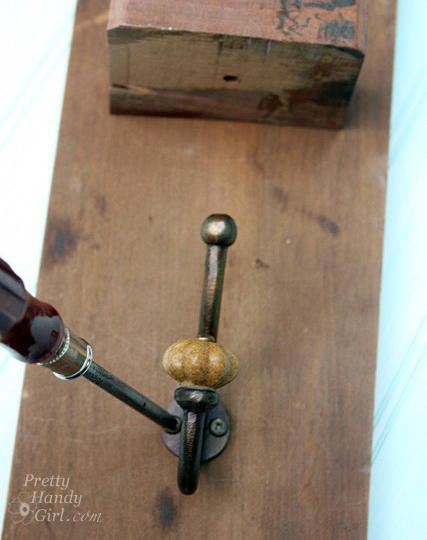 It’s a fairly easy DIY tutorial that I know you can handle. 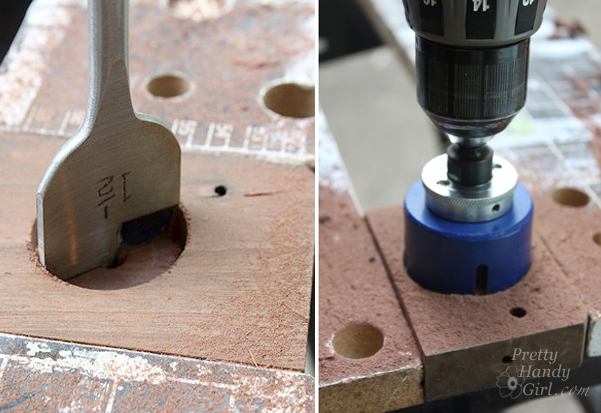 Plus, this is a great project to get you started if you’re still new to working with wood. Before we begin, I think introductions are in order. My name is Brittany aka Pretty Handy Girl. Yup, that’s me replacing my own light fixture. You can definitely replace your own, just follow my tutorial. I won’t bore you with the rest of the details about my life. But, I will tell you that my motto is “If a human being can do it, then there is a 95% chance you can do it too.” This motto is one I work feverishly hard to pass on to my readers. 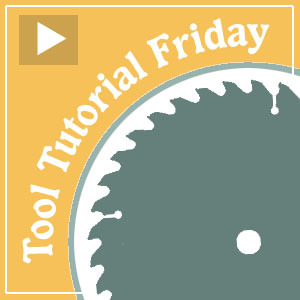 For example, if you are hesitant to pick up a power tool, you’ll love my Tool Tutorial Friday series where I show how to use power saws, nail guns and much more! So, if you want step-by-step tutorials for anything from home décor for the holidays to home repairs and improvements, I’m your gal. 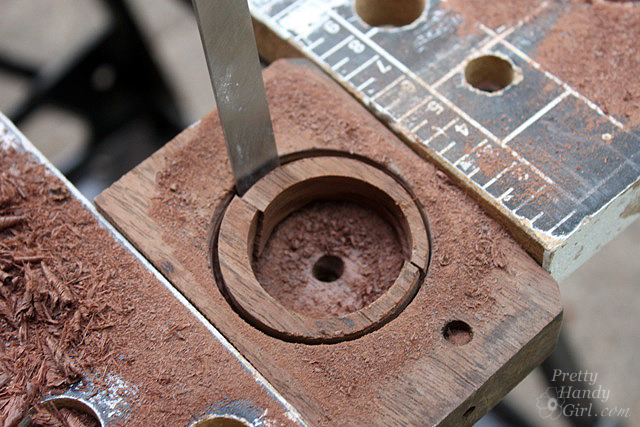 Use a chisel to break out the excess wood. Check the fit by inserting your bottle into the hole. 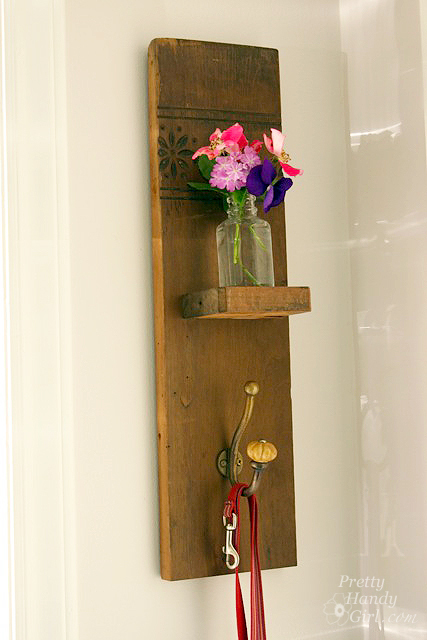 Lay out the location of the coat hook, shelf, and vase and mark the location of each with a pencil. 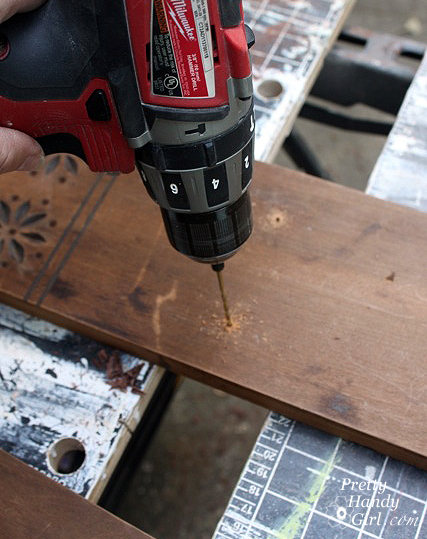 Pre-drill two holes through the wood back piece where the shelf will mount. Clamp the shelf in place (offset the clamp to expose the pre-drilled holes.) 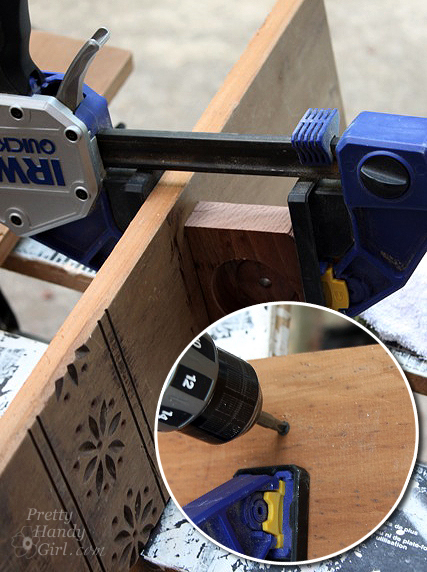 Drive the wood screws through the back and into the shelf to secure it. 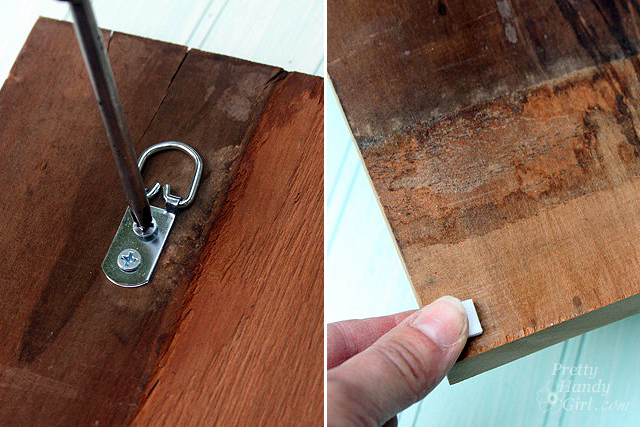 Attach the coat hook below the shelf using small wood screws provided with the hook. 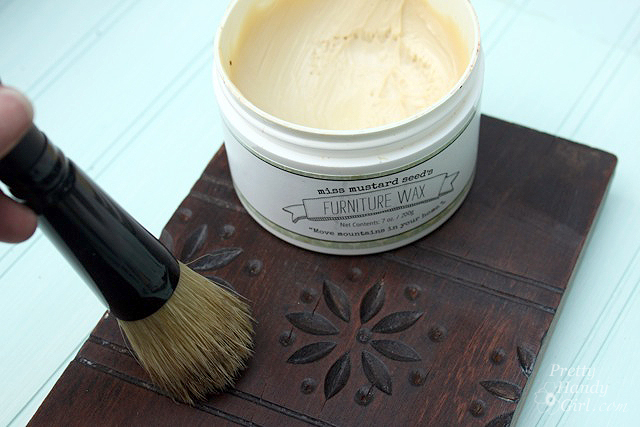 To give the wood a beautiful luster and finish, apply a furniture wax to the wood. 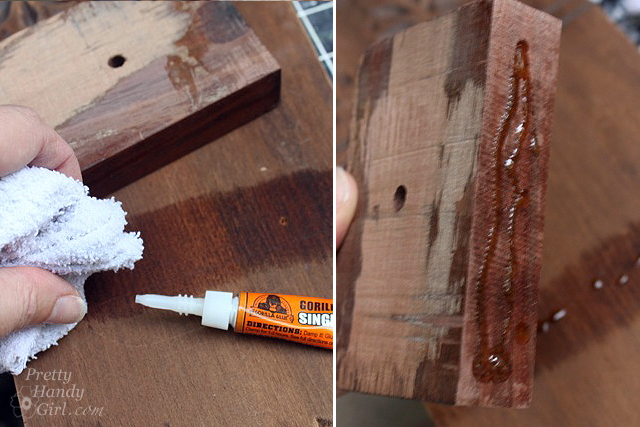 Wait 3-5 minutes for the wax to penetrate and then buff it off with a clean dry cloth. 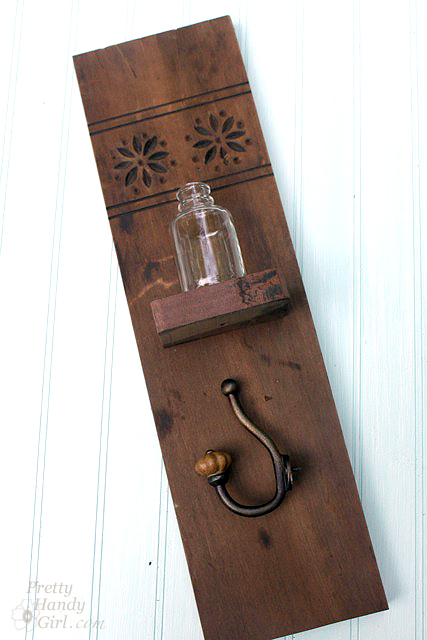 Center one D-hook to the back of the wall sconce. 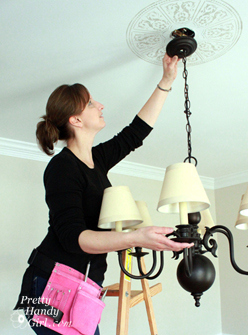 Add rubber bumpers to the bottom corners to avoid any rubbing or swaying on the wall. Hang the sconce on the wall. 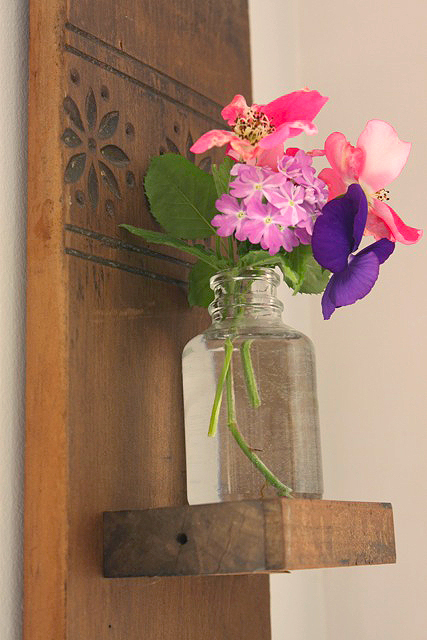 Fill the vase with fresh flowers. They are guaranteed to brighten your morning as you are rushing out the door! What do you think? Could you build this yourself? Have faith in yourself, because I believe you can! This would also make a great gift! If you want more DIY Gift Ideas, you’ll want to follow Trés Frugal, a series of 30 DIY Gift Ideas coming this November to my site. LOVE this idea Brittany! I love the detailing on the shutters! Brittany is amazing! She is so talented & always explains in full detail. Love her. 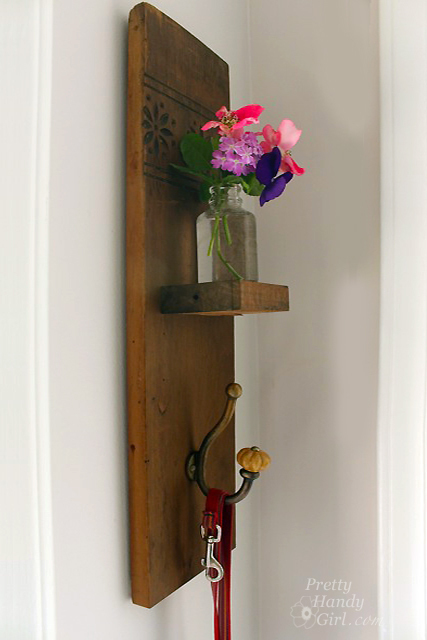 What a nice touch to add a built in vase! I like the idea of seeing fresh flowers right when I walk in the door. 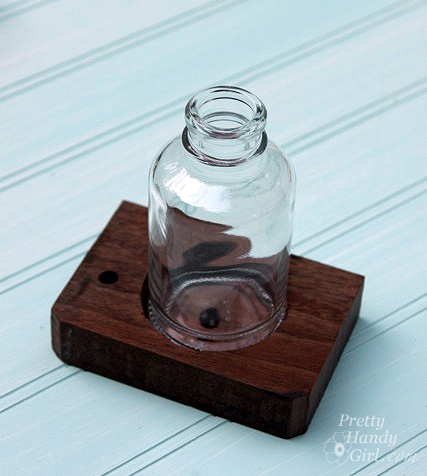 What a cute recycling idea! I love how you kept it simple. I could definitely do this project! 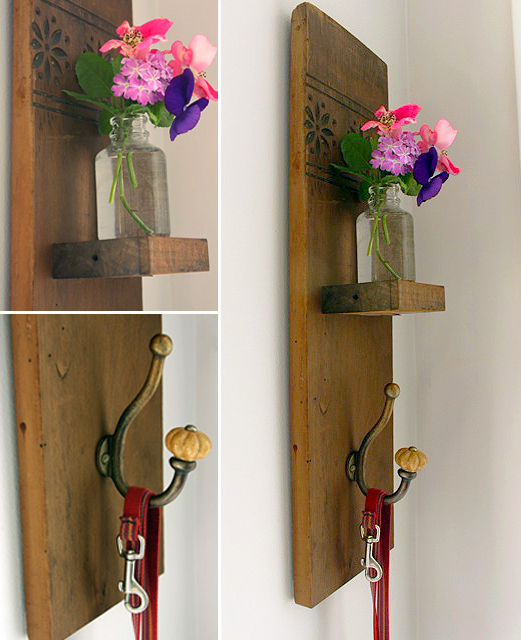 This is a beautiful piece that’s practical and eco-friendly. Love this! Awesome project, Cheryl! I love the look and functionality! What a fun idea! Love the hook on it too! 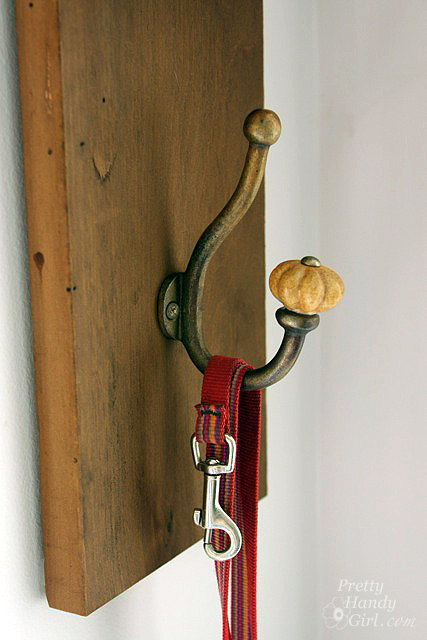 Makes it easy to hang seasonal items or even jackets for small ones. Very cute. Cheryl, thank you so much for having me. And thank you all for your sweet comments! 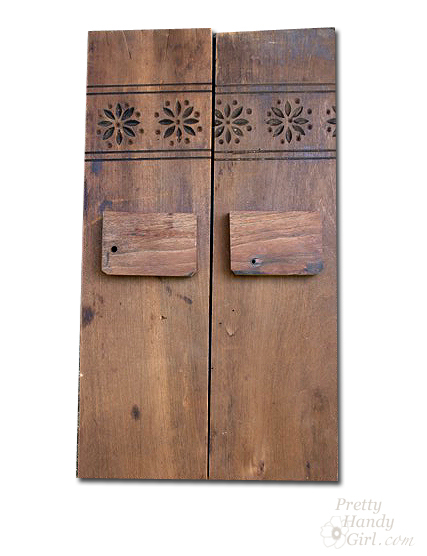 Love this idea, but where did you find the wood with design already on it?